Rewatch Season One of Scorpion – Get Ready for Season Two! 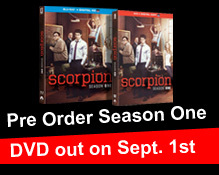 Home » Rewatch Season One of Scorpion – Get Ready for Season Two! Scorpion returns in 29 days, 11 hours & 7 minutes (see countdown to the right)! Season two Premieres Monday, September 21 9/8c. Before the premiere of Season Two, catch up with the team by re-watching Season One-out on DVD September 1st. You can pre order on Amazon or at the CBS Store. For more information on the DVD Features, click here. Can’t wait for September 1st? You can rewatch Season One right now on CBS All Access or you can purchase Season One of Scorpion on iTunes. Check out the following rebroadcasts of Scorpion on CBS.